There’s a whole lot of encouragement happening in the First Reading. It’s mentioned at least ten times! But it’s not your everyday cheerleader encouragement that Saint Paul is referring to here—the kind he speaks of is tied explicitly to affliction and suffering. I don’t know about you, but my year has been filled with a whole lot of suffering that I wouldn’t exactly call encouraging. So what is Saint Paul getting at? The Christians of the early Church knew full well what they were up against. They knew that declaring the Truth would bring them face to face with any number of horrendous tortures. It wasn’t a question of if, but when they would taste the full grit of the Beatitudes: Blessed are you when they persecute you. When Saint Paul wrote these verses in Acts, he knew that to continue such dangerous, saving work they had to spur each other on in hope and courage. How else could so many proclaim Truth in the face of certain persecution? Because of such undying encouragement, the majority of us can enjoy the Word of God proclaimed loud and clear 2,000 years later. Instead of hiding out at secret Masses, we have the pleasure of church bells and Sunday dresses to accompany our Eucharistic gift. But affliction and persecution still remain. We may not carry the scarlet cross of martyrdom, but we stagger under our crosses all the same. The need persists, greater than ever, to rally each other in courage when one more step is too hard, when it would be easier to crumple under the weight and wave a white flag through our vale of tears. It’s in the abyss of those moments that we must allow our Savior to hold us, cross and all, instead of fighting His helping hand. 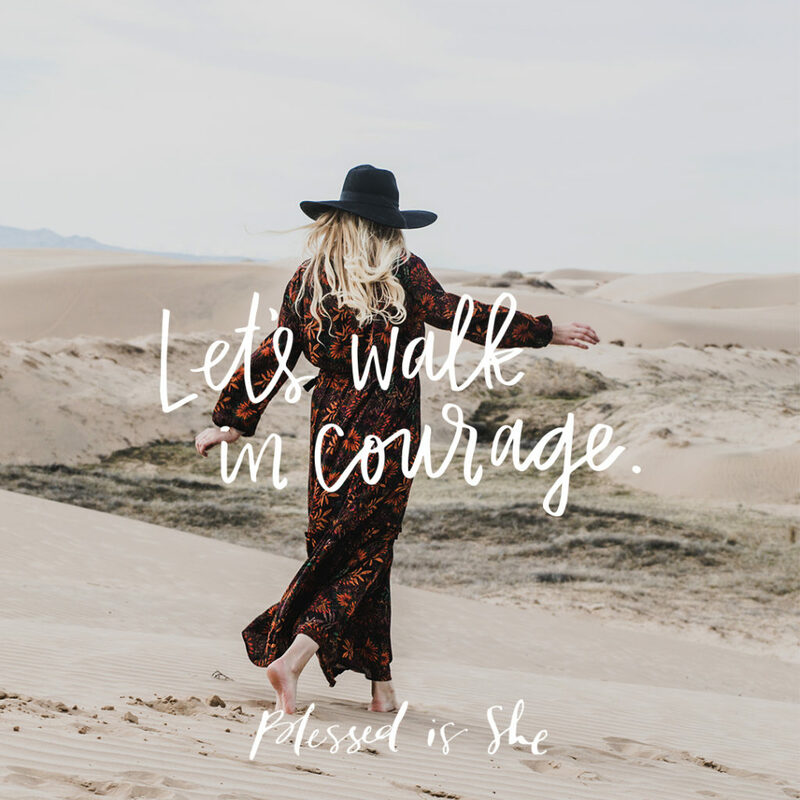 We must ask Him to rally us in courage, to show us the next step, and—in courage—allow our example of faith to in turn encourage our fellow sisters in Christ. Let’s remind each other today that in walking our little way of Calvary in courage alongside His great Passion, it can become our sure path to Heaven. Lay your afflictions at His feet as an offering and ask Him the way forward. Be still, let His encouragement overflow in you, and wait for His loving response. Megan Hjelmstad is a wife and mom 24/7 and an Army Reservist in her “spare” time. She’s a bibliophile, tea drinker, sleep lover, and avid admirer of Colorado’s great outdoors. When the sporadic writing bug hits, you can find her musings on her blog. You can find out more about her here.